Belgium is renowned for its beer and chocolates, but there is more than one reason as to why this country is beloved by expatriates from all over the world. Aside from the abundant gastronomical delights, Belgium boasts an excellent healthcare system, high quality of education and modern infrastructure. Belgium continues to score highly compared to other countries when it comes to "quality of life" with impressive rates of high productivity and low poverty. Belgium competes with France for Michelin stars, illustrating its modern ‘haute cuisine' and its nightlife certainly has the edge over other European cities, with cafés and nightclubs open into the wee hours of the morning. Recent studies show that typical Belgian spends around €35.50 a month on personal items. Monthly consumption of food, drinks, household supplies, utility services, dining expenses and health, amounts on average to €1,200-1500 a month. As an example, a regular 1-liter pack of milk is 0.90€, a 1.5 litre of bottled water 0.95 €, a loaf of fresh bread costs 2.00€, a dozen eggs is 3.00 € and 1kg of fresh cheese costs 12.00€. Local beer costs 1.50 €, a bottle of wine is 9.00 € and a pack of cigarettes costs 5.50 €. Other food-related expenses include the 14 € for one daily meal in the business district and 62€ for a dinner out for two in an Italian restaurant with wine and dessert. For a cheaper alternative, one Big Mac Meal costs 7 €. Entertainment expenses in Belgium include 19 € for two tickets to the movies and 52 € for two tickets to the theatre. One month of fitness gym subscription in the business district will cost 52€. Expats looking for accommodation can find a number of housing opportunities in Belgium, as they are free to own properties in Belgium due to the lack of restrictions on foreign ownership. Key locations for buying properties include the capital, Brussels (home of most government employees), Antwerp (the largest city) and Ixelles. House prices vary depending on the location and size of the property. A villa can go for around USD $250,000, a flat/apartment for around $87,500 and a townhouse for $190,000. Rented accommodation usually costs around 400€ to 650€ per month excluding utility bills, which on average can go up to 45€ to 55€ per month (electricity, gas, water, garbage). The cost of a monthly internet connection can range from 36€ to 90€, depending on the connection and the company. Monthly rent for one bedroom with an attached bathroom will cost around 200€ to 390€, while rent for a two bedroom flat that is fully furnished will cost 800€ to 1,200€ per month. Expats looking for larger accommodation will find that monthly rent for a 3-bedroom flat will cost 750€ to 1,600€ per month. The cost per square meter to buy an apartment within the city is approximately 2,400.00 €. Of course, living outside the heart of the city saves many hundreds of Euros. Note than property tax must be paid and is based on the deemed rental value of the property as set out in the provisions of the "Cadastal Register." National rates are between 1.25-2.5%. Municipal and provincial surcharges also apply. For more information on buying property in Belgium, please contact a real estate agent or visit Belgium’s government website. Expats who own a car will find that petrol costs 1.39€ to 1.60€ a litre, and a monthly ticket for public transportation-related expenses will cost 49€. An inner-city bus ticket will cost 3.00€ to 5.00€, and taxi fares cost 13.50 € (5km). For taxi rides, an agreement on price can be made in advance with the driver, by booking on the phone or while in the taxi stands. In Belgium, you do not flag down a taxi in the street. Concession fares are available for young people and senior citizens. 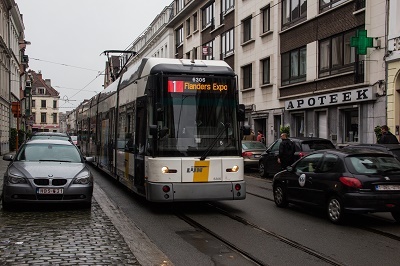 Antwerp, Brussels, Gent and Charleroi are fully equipped with reliable trams for commuters.